How do scientists measure the distance between objects in space? For example, Alpha Centauri is 4.3 light years away. There are a variety of methods used to measure distance, each one building on the one before and forming a cosmic distance ladder. The first, which is actually only usable inside the solar system, is basic Radar and LIDAR. LIDAR is really only used to measure distance to the moon. This is done by flashing a bright laser through a big telescope (such as the 3.5 m on Apache Point in New Mexico (USA), see the Apollo Project) and then measuring the faint return pulse with that telescope from the various corner reflectors placed there by the Apollo moon missions. This allows us to measure the distance to the Moon very accurately (down to centimeters I believe). Radar has been used at least out to Saturn by using the 305 m Arecibo radio dish as both a transmitter and receiver to bounce radio waves off of Saturn's moons. Round trip radio time is on the order of almost 3 hours. If you want to get distances to things beyond our solar system, the first rung on the distance ladder is, as Wedge described in his answer, triangulation, or as it is called in astronomy, parallax. To measure distance in this manner, you take two images of a star field, one on each side of the Earth's orbit so you effectively have a baseline of 300 million kilometers. The closer stars will shift relative to the more distant background stars and by measuring the size of the shift, you can determine the distance to the stars. This method only works for the closest stars for which you can measure the shift. However, given today's technology, that is actually quite a few stars. The current best parallax catalog is the Tycho-2 catalog made from data observed by the ESA Hipparcos satellite in the late 1980s and early 1990s. Given two of the three you can find the third. For the closer objects, for which we know the distance, we can measure the apparent magnitude and thus compute the absolute magnitude. Once we know the absolute magnitude for a given type of object, we can measure the apparent magnitudes of these objects in more distant locations, and since we now have the apparent and absolute magnitudes, we can compute the distance to these objects. It is this relationship that allows us to define a series of "standard candles" that serve as ever more distant rungs on our distance ladder stretching back to the edge of the visible universe. The closest of these standard candles are the Cepheid variable stars. For these stars, the period of their variability is directly related to the absolute magnitude. The longer the period, the brighter the star. These stars can be seen in both our galaxy and in many of the closer galaxies as well. In fact, observing Cepheid variable stars in distant galaxies, was one of the original primary mission of the Hubble Space Telescope (named after Edwin Hubble who measured Cepheids in M31, the Andromeda Galaxy, thus proving that it was an “island universe” itself and not part of the Milky Way). Beyond the Cepheid variables, other standard candles, such as planetary nebula, the Tully-Fisher relation and especially Type 1a supernova allow us to measure the distance to even more distant galaxies and out to the edge of the visible universe. All of these later methods are based on calibrations of distances made using Cepheid variable stars (hence the importance of the Hubble mission to really nail down those observations. Parallax is not the only direct distance measurement (although it is less universally applicable (no pun intended)). There is also the convergent method. @Peter. You are correct. I had completely forgotten about that method. Triangulation. The Earth is not stationary, it moves in a 150 million km (1 AU) radius orbit around the Sun. If you measure the apparent position of a star at different points in that orbit a near enough object will appear to be displaced by a measurable amount, this displacement is called parallax, which is typically measured across a 1 AU baseline. A parsec (3.26 light-years) is the distance that corresponds to one arcsecond* of parallax, and distance is inversely proportional to parallax (so that Proxima Centauri's parallax of 0.7687 arcseconds corresponds to 1.301 parsecs distance, or 4.243 light-years). The more accurately you can measure the apparent position of a star the more accurately you can measure its distance from Earth. At the cutting edge of technology it's necessary to account for relativistic effects from the bending of light due to the Sun's gravity. This is one of my favorite questions in astronomy. It's extremely clever really. The Sun emits a certain colour of light that can be analysed. This colour is obviously completely white other than certain frequencies. 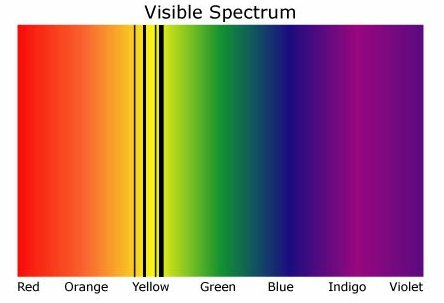 For example, an object emitting a turquoise light would be emitting every colour frequency other than parts of red perhaps (there are other ways like emitting only the colour frequency of turquoise). Alpha_Centauri has a yellow colour so might look something like the following image when the frequency of light is dispersed (effectively what a rainbow is). So you can see the pattern of lines that tell it is helium. However there is a difference in the placement of these lines. The actual helium is further to the right (it might be right in the actual spectrum) so an effect has happened called red shift. This happens because, as the galaxies are moving away from us (an effect of the big bang), they pull the light waves and stretch them out making their frequencies longer. So we can use this to tell how quickly the galaxy is moving away from us and we also know that the universe is expanding at 72.4 km/s/Mpc (this means for every Mpc [or about 3 million light years] the universe is expanding by 72.4 km per second) and from these we can work out the exact distance away from us. I swear the expansion of the universe isn't constan, because people thought it was slowing down, and then quite recently found it was increasing. Or am I getting 2 different things mixed up? Also won't this shift be affected by the speed the star in question is travelling around it's/the galaxy? This post imported from StackExchange Physics at 2014-03-24 04:41 (UCT), posted by SE-user Jonathan. Well this is apparently acutare to +/- 3.6 seconds so this should be right, I suppose they might have been wrong about it before. Or maybe it's the rate it's increasing is decreasing. This isn't an accurate way to measure it though, I think it's just cool that you can tell exactly what a star is made of and how far away it is just by its colour. I know, it is amazing :) When my astronomy teacher first told my class about it I thought he has joking. Because you see in scifi films and tv, when space ships scan stars and see what they're made of, and it just sounded so fake :) Even if it's not accurate I guess it helps validate alternative methods. Yeah probably, lol I know what you mean. This only works for objects affected by universal expansion (distant galaxies). You can't use redshift to tell how far a star in the galaxy is, only how fast it is moving away (or towards) us. A little known method is the convergent point method (or moving cluster method). Stars in open clusters move parrallel through space and due to the perspective effect they will appear to move towards a common point on the sky. This point depends on the distance and the distance can thus be calculated if the point in the sky can be determined. I have never seen this method mentioned in any astronomy book, but it was the subject of an astronomy class I took (in Heidelberg, but that is irrelevant). The moving cluster method was in fact the only way astronomers had to measure the distance to these clusters with any precision for some time in the early 20th century." The newer (better) proper motion determinations from Hipparcos should enable extension of this method further out (the doppler data is already known), at least as an internal control. A good description of this method with good diagrams for illustration can be found in The Distance to the Hyades Star Cluster (PDF).